Find Clarion Inn Lake Buena Vista, a Rosen Hotel deals, discounts and special offers. 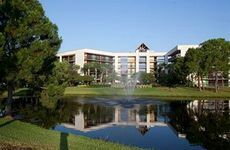 Convenient hotel a few miles from golf and Downtown Disney, featuring two heated pools and shuttles to area theme parks. This contemporary hotel is located near the Convention Center, and offers a lap pool, spa, tennis and golf. Orlando's landmark hotel focuses on art and music, with a masterpiece art gallery and 250 rooms and suites. This Loews hotel is located on the Bay, offering 750 rooms, full spa and children's camp. With an elegant lobby and 11 places to dine, the Ritz-Carlton guest rooms have lake-view balconies. Several restaurants, outdoor gardens, function rooms and 750 rooms with balconies and wireless make up this Hyatt. This family-friendly Marriott Resort is located on 200 acres of tropical gardens, with golf, pools and fitness center. The Rosen Shingle Creek, on 230 acres, has 1,500 rooms, golf, and several very large suites suitable for gatherings. Located next to Walt Disney World, this resort features 45 holes of Jack Nicklaus signature golf and a nature preserve. The Rosen Plaza, adjacent to the Convention Center, has 800 rooms, is ADA compliant, and offers a heated pool. In addition to 1218 1-bedroom suites, the Caribe Royale has 120 lakefront villas, waterfalls, atrium and a lagoon. Located near SeaWorld and Universal Orlando, this Hilton Garden Inn has a restaurant and meeting space. The Crown Plaza in downtown has 13 floors, rooms and suites, fitness center, and a business center. Certified "Green Lodging" in Walt Disney Resort, the family-friendly Buena Vista has a spa and many restaurants. This downtown hotel has easy access to the business and cultural centers, and offers 341 room and suites. The mission-style Hard Rock is filled with rock n' roll memorabilia and offers a water taxi to Universal Orlando.